Objectives: To assess the construct validity and reliability of the motivation section of the Motivated Strategies for Learning Questionnaire in Saudi Arabia. Methods: A cross-sectional study using the Motivated Strategies for Learning Questionnaire (MSLQ) was conducted. The MSQL has essentially two sections: a motivation section and a learning strategies section. The motivation section, which consists of 31 items, was used. A total of 146 medical students who were all male completed the questionnaire. Confirmatory factor analysis was used to test the hypothesised factor structure, and to identify the validity and reliability of the motivation section of the MSQL. Results: A selected group of fit statistics showed that the hypothesised model did not fit the sample data fairly well. The Intrinsic Goal Orientation subscale consisted of 4 items (α = 0.75), the Extrinsic Goal Orientation subscale consisted of 4 items (α = 0.78), the Task Value subscale consisted of 6 items (α =0.86), the Control of Learning Beliefs consisted of 4 items (α =0.78), the Self-Efficacy for Learning and Performance consisted of 8 items (α =0.89), and the Test Anxiety consisted of 5 items (α =0.77). Conclusions: It is concluded that the hypothesised model did not fit the data well. This may suggest that the motivation section of the MSQL may not work for Saudi Arabian students. However, this could be due to the fact that the sample data available on this study did not represent female students. Further work is required to establish this. Limitations of the study are discussed. The MSLQ is based on a general cognitive view of motivation and learning strategies in which the student is an active information processor, and beliefs and cognitions mediate instructional input.1 The questionnaire consisted of two sections. The first section was designed to measure the academic motivation used by students. The second section was intended to measure the types of learning strategies. Since these sections measure two different constructs, therefore each section can be used separately or together. Therefore, based on the purpose of this study, researchers can use one of these sections or use both sections together.1,5 As the purpose of this study is to fit a model for the academic motivation of medical students, the section of motivation is used. The MSLQ, either in its entirety or the form of selected subscales, has been used in many different ways to improve learning. For instance, it has been used to measure the nature of motivation across different course subjects,9-13 and different populations.5, 14 It has also been used to measure the motivational effects of various aspects of teaching strategies and course structures.15-18 The MSLQ is a reliable and valid questionnaire for measuring academic motivation in some different countries with different cultures, including Estonia, Iran, Turkey, Pakistan, Portugal, Spain, China and America.5,19-23 It has also been used to improve education for undergraduate medical students and other healthcare students.2-5 Therefore, the questionnaire can be used for different cultures to monitor and enhance the quality of educational strategies. However, no previous studies have investigated the hypothesised model of the academic motivation section among Saudi Arabian medical students. Since social and cultural issues can be threats to the validity of test scores,24 one may argue that the MSLQ might perform differently among Saudi Arabian medical students who their culture is different with Western culture. If this is the case, the MSLQ is required to be revised.25 Therefore, the aim of this study is to shine new light on these debates through an investigation of the hypothesised structure of the academic motivation section of the MSLQ1 among Saudi Arabian medical students. A further aim is to provide reliability evidence for the subscales of the academic motivation of the MSLQ. A cross-sectional study was used to investigate the hypothesised model of the motivation section of the MSLQ. To achieve this, a total of 146 medical students in the University of Prince Sattam Bin Abdulaziz was recruited using a convenience sampling strategy. The University has recruitment targets for male students. For that reason, all of the participants of the study were male. They were in the second to the sixth year of their studies. Prior to undertaking the investigation, ethical clearance was obtained from the Research Ethical Committee in the University of Prince Sattam Bin Abdulaziz, College of Medicine, Saudi Arabia. In order to protect research participants, the confidentiality and anonymity of participants and their data were preserved. To collect data in a professional manner, we sent the questionnaire to the department of education at the University in order to print and distribute our survey questionnaires to the students. To gather an adequate sample size, the data were collected in different places. For example, some students completed the questionnaires in class time, and other students completed the questionnaire in the department of education. Confirmatory Factor Analysis of the responses was performed using the statistical packages SPSS and AMOS (version 22). This procedure was used both to measure the construct validity of the academic motivation section of the MSLQ and to test the fit of the hypothesised model to the sample data. To evaluate the construct validity of the questionnaire and assess whether the data fit the empirical model, a CFA was performed. The following fit statistics were used to identify the model fit: the chi-square statistic ( a p-value higher than 0.01 suggests that the fit of the data to the hypothesised model is entirely adequate ).31 The standardized root mean square residual (SRMR) ( values higher than 0.09 suggests the sample data fit the model).32 The Tucker-Lewise Index (TLI) ( a value ≥ 0.95 suggests the data adequately fit the model).32 The root mean square error of approximation (RMSEA) ( values < 0.06 suggests the initially hypothesised model fits the data well).32 The comparative fit index (CFI) ( a value ≥ 0.90 suggests acceptable model fit).33 Besides, the internal consistency reliability of the scale scores was measured using Cronbach’s alpha. 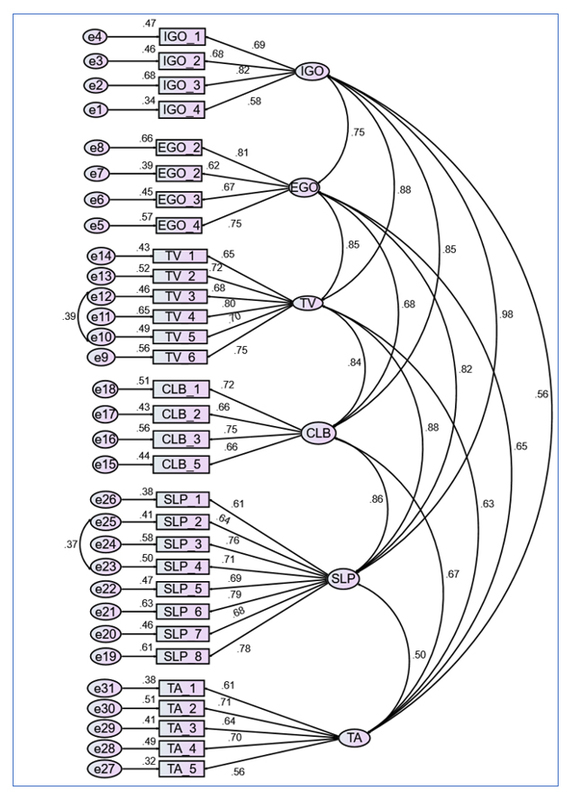 An alpha of 0.70 is acceptable score reliability.34 The multiple imputation techniques was used to replace missing values prior to analysis which is used for structural equation modelling.29,30 Finally, the path diagrams were drawn to display the hypothesised model of the academic motivation section of the MSLQ. Table 1 shows the mean and standard deviation for each item within each subscale. As can be seen from the Table, Cronbach’s alphas for the subscales are satisfactory, a range from 0.75 to 0.89. The hypothesised six-factor model of the academic motivation of the MSLQ is described graphically in Figure 1. Circles represent latent variables and rectangles represent measure variables. The single-headed arrowsrepresent the factor loadings (regression), and the bidirectional curved arrows represent factor correlations (factor covariance for unstandardized solutions). The path diagram also shows relationships among variables. The numbers “1” in the diagram reflect that the regression coefficient has been fixed to 1. As we hypothesised a six-factor model is confirmed in the academic motivation of the MSLQ, the model was tested using fit statistics. The results of fit statistics for the one-factor model and the six- factor model are presented in Table 2. The values for the one-factor model indicate a poor fit between the model and the observed data. For the six-factor model, the only value that fits the model is SRMR which is less than 0.009. Taken together, these values suggest that both models do not fit our data set. The six- factor model of the academic motivation section of the MSLQ - NOTE: IGO = Intrinsic Goal Orientation; EGO = Extrinsic Goal Orientation; TV= Task Value; CLB= Control of Learning Beliefs; SLP= Self-Efficacy for Learning and Performance; TA= Test Anxiety. This study set out with the aim of assessing the academic motivation section of the MSLQ, using the CFA approach, in order to monitor and enhance teaching and learning among Saudi Arabian medical students. The results of this study show the academic motivation section of the MSLQ has satisfactory internal consistency reliability. Contrary to exceptions, this study did not approve the hypothesised model of the academic motivation section of the MSLQ to be used for Saudi Arabian medical students. Alternatively stated, the model may not work for monitoring and improving teaching and learning in medicine. Alternatively, our data sample may not represent the whole student given that female students are not included in this study. However, these results match those observed in the previous studies.22, 35-38 For example, in a study, using medical residents, the researchers found that the original model fit poorly to their data.22 Furthermore, a poor fit was also found in another study that tested the validity of the questionnaire.35 It is difficult to explain these results, but it might be due to the fact that the educational and cultural contexts are different among Saudi Arabian medical students. Although the score reliability of the subscales of the academic motivation of the MSLQ is encouraging, there is abundant room for future research. Finally, a number of important limitations need to be considered. First, the study is limited by the lack of data on female students. Secondly, the data only came from a single institute. Therefore, the generalisability of these results is limited to the target population. Finally, the major limitation of this study is the low sample size. These limitations mean that study results need to be interpreted cautiously. The present study was designed to measure the construct validity of the motivation section of the MSLQ and to assess its hypothesised model. The results of this study show the motivation section of the MSLQ is a reliable measure. However, the data do not fit the hypothesised model and therefore the questionnaire may not be valid. The reliability of scale score may encourage researchers to conduct further studies in order to obtain a clear picture of the MSLQ. This research has generated some questions in need of future investigations. For example, a future study with more focus on both genders is suggested. In addition to this, a large sample size could provide a clear picture of both sections of the MSQL for Saudi Arabian medical students. Pintrich P, Smith D, Garcia T and Mckeachie W. Reliability and predictive validity of the motivated strategies for learning questionnaire. Educational and Psychological Measurement. 1993; 53: 801-813. Kusurkar RA, Ten Cate TJ, van Asperen M and Croiset G. Motivation as an independent and a dependent variable in medical education: A review of the literature. Med Teach. 2011; 33: e242. Schunk D, Meece J, Pintrich P. Motivation in education: theory, research, and applications. Essex: Pearson Education Limited; 2014. Goodman S, Jaffer T, Keresztesi M, Mamdani F, Mokgatle D, Musariri M, Pires J and Schlechter A. An investigation of the relationship between students' motivation and academic performance as mediated by effort. . South African Journal of Psychology. 2011; 41: 373-385. Duncan TG and McKeachie WJ. The Making of the Motivated Strategies for Learning Questionnaire. Educational Psychologist. 2005; 40: 117-128. Pintrich P. A process-oriented view of student motivation and cognition. New Directions for Institutional Research. 1988; 57: 65-79. Pintrich P. Student learning and college teaching. New Directions for Teaching and Learning. 1988; 33: 71-86. Pintrich, PR, Smith DA, Garcia T, McKeachie WJ. A manual for the use of the motivated strategies for learning questionnaire (MSLQ). Ann Arbor, MI: University of Michigan; 1991. Bandalos D, Finney S and Geske J. A model of statistics performance based on achievement goal theory. Journal of Educational Psychology. 2003; 95: 604-616. Zusho A, Pintrich PR and Coppola B. Skill and will: The role of motivation and cognition in the learning of college chemistry. Int J Sci Educ. 2003; 25: 1081-1094. Brookhart SM and Durkin DT. Classroom assessment, student motivation, and achievement in high school social studies classes. Applied Measurement in Education. 2003; 16: 27-54. Ommundsen Y. Implicit theories of ability and self-regulation strategies in physical education classes. Educational Psychology. 2003; 23: 141-157. Rao N, Moely BE and Sachs J. Motivational beliefs, study strategies, and mathematics attainment in high- and low-achieving Chinese secondary school students. Contemp Educ Psychol. 2000; 25: 287-316. Vogt C. An account of women's progress in engineering: a social cognitive perspective. J Women Minor Scien Eng. 2003; 9(3-4):22. Hargis J. Can students learn science using the Internet? Journal of Research on Computing in Education. 2001; 33: 475-487. Hancock DR. Influencing graduate students' classroom achievement, homework habits and motivation to learn with verbal praise. Educational Research. 2002; 44: 83-95. Niemi H, Nevgi A and Virtanen P. Towards self-regulation in web-based learning. Journal of Educational Media. 2003; 28: 49-71. Cheang KI. Effect of learner-centered teaching on motivation and learning strategies in a third-year pharmacotherapy course. . Am J Pharm Educ. 2009; 73: 42. Saks K, Leijen Ä, Edovald T, Õun K. Cross-cultural adaptation and psychometric properties of the Estonian version of MSLQ. Procedia - Social and Behavioral Sciences. 2015; 191:597-604. Feiz P, Hooman H, kooshki S. Assessing the motivated strategies for learning questionnaire (MSLQ) in Iranian students: construct validity and reliability. Procedia - Social and Behavioral Sciences. 2013;84:1820-1825. Ilker GE, Arslan Y, Demirhan GA. Validity and reliability study of the motivated strategies for learning questionnaire. Education Sciences: Theory & Practice. 2014;14(3): 829-833. Cook DA, Thompson WG and Thomas KG. The motivated strategies for learning questionnaire: score validity among medicine residents. Med Educ. 2011; 45: 1230-1240. McKeachie W, Pintrich P, Lin Y. Teaching learning strategies. Educational Psychologist. 1985;20(3):153-160. Cook DA and Beckman TJ. Current concepts in validity and reliability for psychometric instruments: theory and application. Am J Med. 2006; 119: 166-167.
International Test Commission. International guidelines on test adaptation. [Cited 15 Feb 2016]; Available from: https://www.intestcom.org/files/guideline_ test_adaptation.pdf. Taylor R. Review of the motivated strategies for learning questionnaire (MSLQ) using reliability generalization techniques to assess scale reliability (Doctoral dissertation). Auburn: Auburn University; 2012. Olivari MG, Bonanomi A, Gatti E, Confalonieri E. Psychometric properties of the motivated strategies for learning questionnaire (MSLQ) among Italian high school students. 14th European Congress of Psychology; Milan, 7-10 July 2015. Micol Tummino, Martina Bollati, Martina Widmann; 2015. Hamilton RJ and Akhter S. Construct validity of the motivated strategies for learning questionnaire. Psychol Rep. 2009; 104: 711-722. Allison P. Missing data techniques for structural equation modeling. J Abnorm Psycho. 2003;112(4):545-557. Schafer JL and Graham JW. Missing data: our view of the state of the art. Psychol Methods. 2002; 7: 147-177. Brown T. Confirmatory factor analysis for applied research. New York: the Guilford Press; 2006. Hu L and Bentler PM. Cutoff criteria for fit indexes in covariance structure analysis: conventional criteria versus new alternatives. Structural Equation Modeling: A Multidisciplinary Journal. 1999; 6: 1-55. Hooper D, Coughlan J, Mullen MR. Structural equation modelling: guidelines for determining model fit. The Electronic Journal of Business Research Methods. 2008;6(1): 53 - 60. Tavakol M and Dennick R. Making sense of Cronbach's alpha. Int J Med Educ. 2011; 2: 53-55. Cho MH, Summers J. Factor validity of the motivated strategies for learning questionnaire (MSLQ) in asynchronous online learning environments. Journal of Interactive Learning Research. 2012;23(1): 5-28. Earley M, Wisneski R, Fasko D. A critical literature review of the motivated strategies for learning questionnaire (MSLQ). 12th Biennial Conference of the European Association for Research on Learning and Instruction. August 28- September 1, 2007; Budapest, University of Szeged. Lynch DJ. Motivational factors, learning strategies and resource management as predictors of course grades. College Student Journal. 2006;40:423-8. Watson M, Mcsorley M, Foxcroft C and Watson A. Exploring the motivation orientation and learning strategies of first year university learners. Tertiary Education and Management. 2004; 10: 193-207.